BIRMINGHAM, England — Genzebe Dibaba’s mastery of the indoor oval continues. Dibaba of Ethiopia, the indoor world record holder at 1500m, the mile, 2000m, 3000m and 5000m, put the hammer down during the final kilometer of the women’s 3000m, the opening track event at the 2018 IAAF World Indoor Championships, to break things open and found just enough over the thrilling final lap to hold off Sifan Hassan and Laura Muir to secure her third world indoor title in 8:45.05 after a 2:37.43 final 1k and 30.44 final lap. Muir gave the home crowd something to cheer about with her first global medal. This was Dibaba’s 4th indoor world title (3 straight at 3000m, plus a 1500m title from 2012) tying Meseret Defar for the most ever by a long-distance runner (Maria Mutola won seven 800m titles indoors). Dibaba is also entered in the 1500 here, so she’ll have the opportunity to surpass Defar. 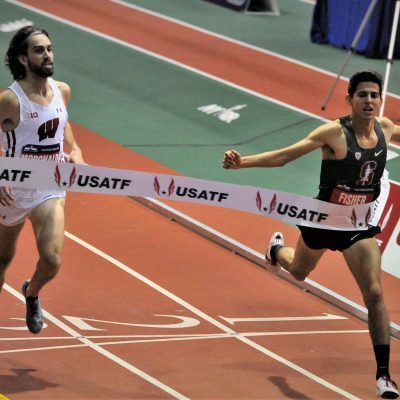 Tonight’s race started slow, with the field content to take its chances of trying to outkick the fastest indoor runner ever. Konstanze Klosterhalfen of German did most of the leading but with the first 1600 in a very 4:58.66, all the contenders were in contention. Dibaba decided to start the racing just before 2000m when she seized the lead. Her final 5laps ended up being a masterclass of how to tighten down the screws and squeeze the life out of the rest of the field. 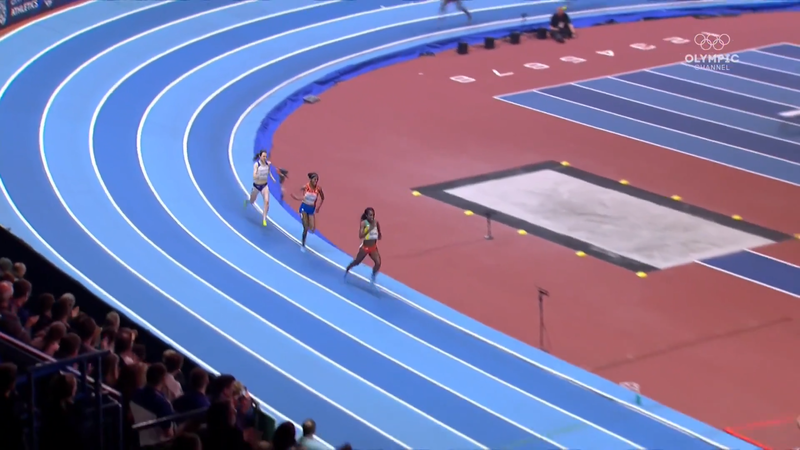 A 64.5 next 400m gave her a few meters’ lead over Hellen Obiri, but Dibaba was just getting going. A 31.2 next lap was too much for Obiri as Hassan was now the closest chaser, 6 meters back followed by Muir with 400m to go. 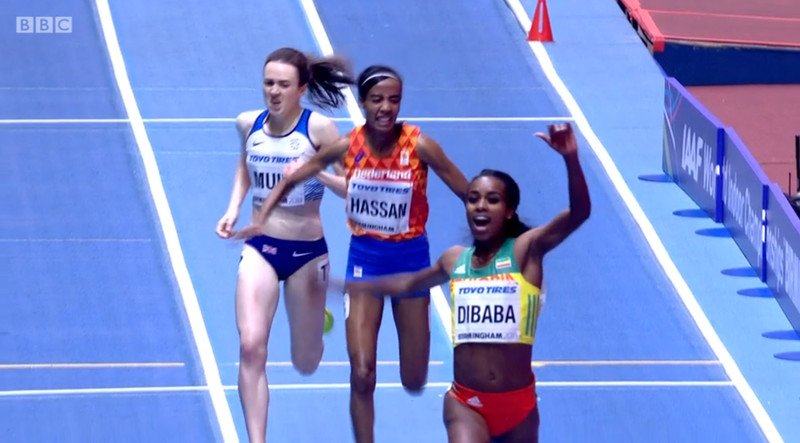 Dibaba kept up the tempo he next lap (31.2) and the lead over Hassan and Muir was the same at the bell, as the rest of the field had totally cracked and fallen way back. The only question now was the color of the medallists between the top three. 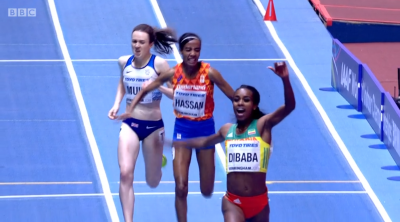 Hassan and Muir closed the gap on Dibaba on the backstretch and even halfway around the final turn, but Dibaba had a little something left the final straight as her final lap was the fastest (30.44) and good for gold. Muir had a great final straight as well and nearly caught Hassan but had to settle for bronze in part because a tiring Hassan veered out way wide late forcing Muir to finish in lane three. Results and quick take analysis below. You can watch the final 250 below. Dibaba was the best runner on paper and ran like it tonight. She didn’t let the race come down to a final 400m. Her tactics effectively said, “If you’re going to beat me, it’s going to have to be over 1000m” and no one could do it. Obiri tried to cover Dibaba’s move right away today, but her fitness clearly isn’t at her top-end level, but the others were not quite ready to respond and that made beating Dibaba even harder (see next point). A few laps later, his assessment proved correct. 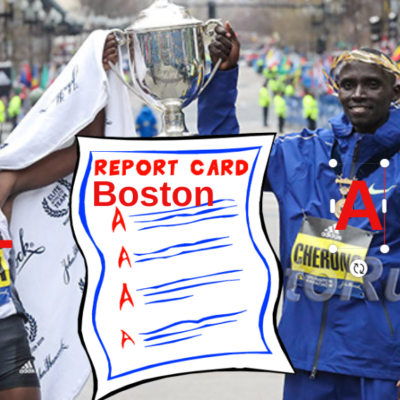 Tactics contributed to Hassan losing this title. The opening stage of this race was slow. When a race is going tactical, you don’t want to be spotting the field unnecessary distance at any point in the second half of the race as it could pick up at an minute. Hassan had to realize the pace was going to pick up and yet she continued to run in the back until Dibaba went to the lead just before the 2k mark. 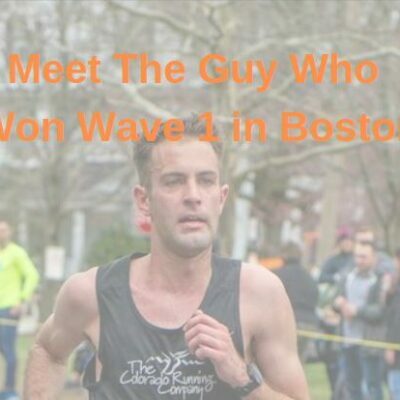 Guess who had the fastest last 1k of the race? Hassan by 1.1 seconds. Guess who had the fastest last 200 of the race? Hassan by a quarter second. Guess who won the race? 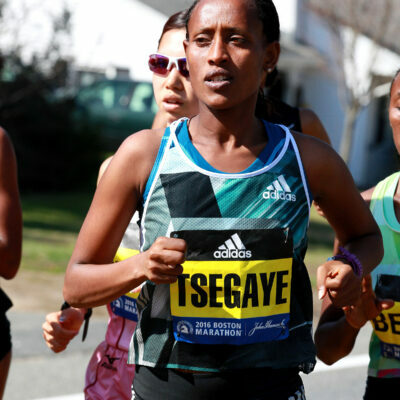 Not Hassan as she needlessly spotted one of the greatest women’s distance runners in history 1.7 seconds at 2k. 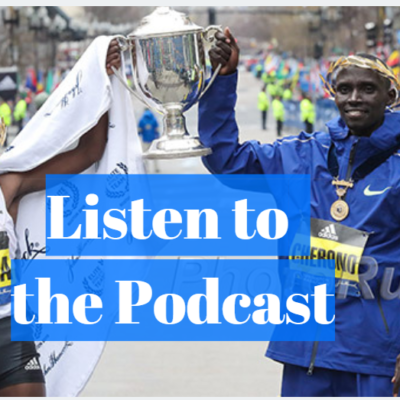 We went back and did our best to hand-time each of Dibaba and Hassan’s final 5 laps when the real racing was going on. Hassan was faster on 4 of the 5 laps. 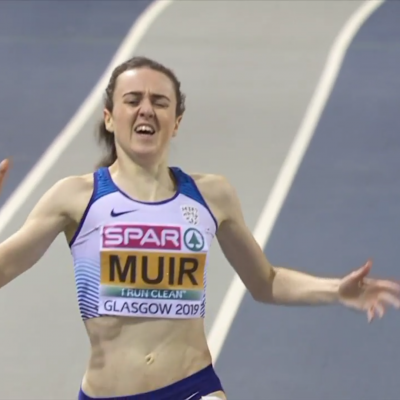 In the 2016 Olympic 1500 final, and to a lesser extent in the 2017 World Championship final, Muir moved aggressively in responses to moves made by the leaders and failed to medal each time. However when Dibaba moved tonight, she remained patient and that patience paid off with a medal. Muir’s explanation was very similar to what we heard Jenny Simpson say after her silver in London last year. And like Simpson, Muir was very strong in the home stretch and probably should have earned the silver (depending on how you view Hassan drifting out to lane 2 in the home stretch). QT #4: Should Sifan Hassan have been DQ’d? After the race was over, one of the first questions we had was whether Laura Muir be elevated to silver. Coming around the final turn, Hassan was running in the inside of lane 1. But midway down the home stretch, with Muir (who was running in the outside of lane 1) closing the gap, Hassan began drifting out, forcing Muir to go wide. During the final 10 meters, Hassan began drifting even more dramatically, finishing the race in the outer third third of lane 2 with her arms out wide, forcing Muir into lane 3. We talk more about this in a separate article: LRC Should Sifan Hassan Beene DQd? MB: Should Sifan Hassan be DQd? Laura Muir was supposed to fly from Glasgow to Birmingham yesterday. But snow cancelled that. Snow cancelled the trains as well. So she had to take a 300-mile cab ride, which she said took eight hours due to the weather (Google Maps says it should only be 4 hours, 40 minutes with normal conditions). In fact, yesterday afternoon Muir was worried that she might have to miss the meet. There was a foot of snow on the ground in the Glasgow and the cab driver was two hours late picking her up. “It was crazy,” Muir said. “We couldn’t see the bonnet (hood) and the windscreen wipers were freezing. It took us six hours, but we got here about 11:00 last night. Tonight was Houlihan’s third global final. 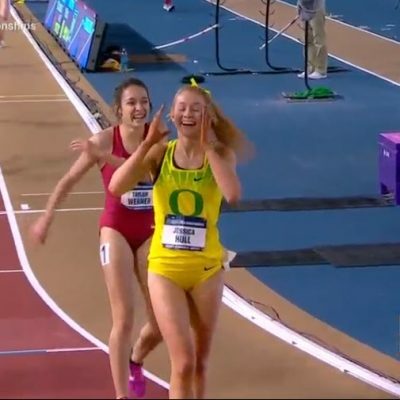 She was 11th in the 5k at the 2016 Olympics and 13th in the 5k at Worlds tonight, and though she placed a lot higher tonight to take 5th, she was still a bit disappointed. Houlihan felt that she should have responded more quickly to the move, but that’s hard to do when Dibaba is ripping off low-32s and 31s. Houlihan also said that she had “probably the weirdest warmup I’ve ever had.” Snow was falling all day in Birmingham, and the area around the arena was covered by the time Houlihan had to warm up. Thus, she and fellow American Katie Mackey had to resort to running figure-eight “loops” in a parking garage. Houlihan won’t have much time to recover as she runs the first round of the 1500 tomorrow evening. 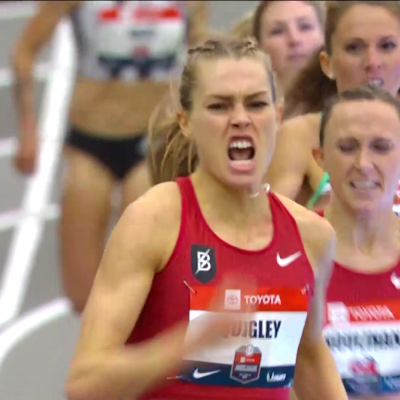 Mackey knew that a hard move was coming, and Dibaba made it with 1k to go. Mackey couldn’t respond, but hoped that if she ran smart, a few women would fade. Mackey couldn’t move up as much as she would have liked, but 8th in the world is a fine result for her. This was a stacked field, and all of the women who beat her have faster PRs and are women you would expect her to lose to. She acquitted herself very well, and 8th in the world is a great way to end the season of a woman who had never made a Worlds team in her life two weeks ago. Talk about the day 1 action on our world famous messageboard.